It is with great sadness that we report that our FFGR, Inc. family has lost a wonderful greyhound. 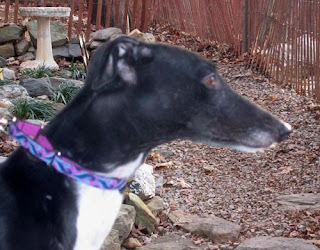 Randy Wixom and Liza Brown lost their sweet greyhound Tara. Tara got very sick recently and did not make it through the illness. Tara was born March 4, 2002 and was eight years old. Randy and Liza adopted Tara in January of 2006. She was the light of their lives. Randy, Liza and Tara have been like family to our group. From the time they adopted Tara, they volunteered steadily for our organization. Tara was in attendance at all of the picnics, lots of meet and greets, all of our yard sales and all of the Bon Ton Community Day events. Randy and Liza have continually helped our group in so many ways. This is one of some very serious losses the family has experienced recently. In the last two years, Liza has lost her two brothers to cancer, her mother became ill and had to move in with them (along with her two scotties), and most recently, her mom had to be placed in a long term care facility for alzheimers. When her mother moved in with Liza and Randy, the FFGR, Inc. annual yard sale was held at their house because her mom donated all of her belongs to the sale and then they donated all of the proceeds from the sale to our group. Randy and Liza fostered numerous hounds for us over the years. Liza and Randy live on the same street as Kip and J.D. and they have been like family together for years. Tara was always at Kip’s and J.D.’s house and their dogs always visited with Liza, Randy and Tara. They were like one big family. We have always been amazed at how many people on that street all know and love the greyhounds because they all knew and loved Tara. We know that Tara will be greatly missed. But we also know that she had the most loving and caring home that any greyhound could have had. Run free sweet Tara.